Join me for an amazing night of LIVE music on Wednesday March 30, 2016. I’ll be opening up the show featuring Xenia Rubinos and Quantic. Want to help spread the word? Connect on the Facebook event, RSVP and share. This spring 2016, Quantic, headed by producer, selector, musician & DJ, Will Holland, will be touring live across North America. 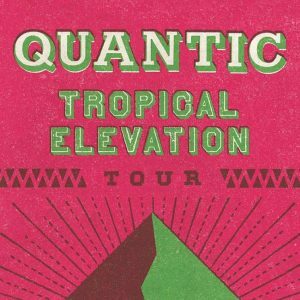 Quantic returns to the open road with a live band this spring. Kicking off on March 3rd, 2016 in Atlanta, and playing in over 20 cities across North America, the coveted studio sound of Quantic will be live and direct on stage. Will Holland is known for his adventurous musical productions, and skill for marrying a variety of sounds with the modern dance floor aesthetic. On this tour, he will be joined by legendary Colombian drummer/percussionist Wilson Viveros, and Texas-born multi-instrumentalist and regular Quantic collaborator, Sylvester Onyejiaka on horns and keys, with additional special guests to be announced. Velasquez, and more, Quantic will be touching upon these projects, yet taking the dance-floor vibe up another notch. Expect an evening of tropical rhythm, bass lines a plenty and inspiring music for all. Music maker Xenia Rubinos uses her powerful voice to create beats and melodies from scratch. Xenia’s sound grows from a wide range of influences from r&b and hip-hop to Caribbean rhythms all delivered with a soulful punk aura.